C/O Vietnamese-American Initiative for Development, Inc. Scope: New construction of a four-story wood-frame residential building containing twenty-seven family sized dwelling units with a partial basement, outdoor space and 13 parking spaces. The exterior facade is a combination of veneer brick; metal composite panel and fiber cement siding. The project is LEED-Silver Certifiable, and includes such elements as a white TPO roof, fuel efficient vehicle parking, drought tolerant plantings, and indoor secure bicycle storage. “The site had many challenges, including the removal of old granite foundation walls adjacent to the sidewalks, poor soil conditions requiring additional excavation/backfill, hazardous soils removal, ledge removal and a major dewatering operation. The objective was to build a high efficient, low maintenance building that enhances the neighborhood on a very tight budget. The exterior façade makes a statement of what this project is about with its combination of brick veneer, metal panels systems and fiber cement siding. The entire project is built for the long term, as evidenced by the durability of the products and its energy efficient design, of paramount importance in any project built today. The interior is inviting with excellent circulation and the building is equipped with many safety features, including an emergency generator. 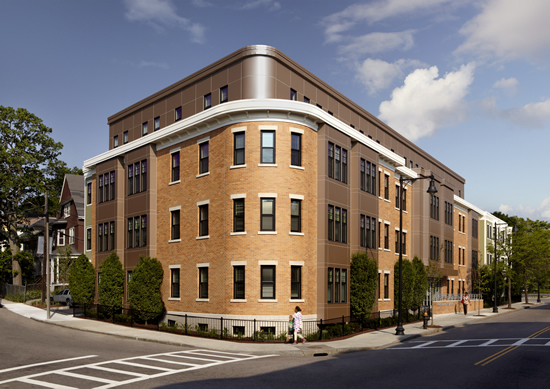 Finally, Bloomfield Gardens was constructed by many local M/WBE businesses and subcontractor workforces which utilized a high percentage of Boston residents, minority and female workers, an example of Bilt-Rite’s commitment to promoting a diverse workforce and providing meaningful and lasting benefits to the communities in which we work”.